At Sunday night’s ROH Bound by Honor event in Miami, Stardom wrestler Mayu Iwatani became the new Women of Honor champion. Iwatani defeated Kelly Klein for the championship, which streamed live on the Honor Club streaming platform. Klein held the title since Final Battle in December and had been doing a story where she put the title on the line each time she had a singles match. 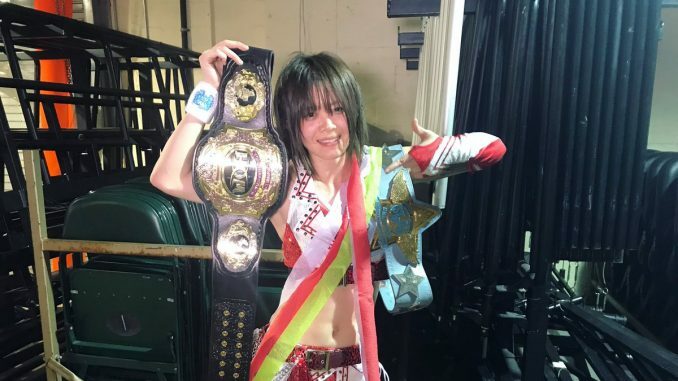 Iwatani becomes the third Women of Honor champion since the title was introduced last year and won by Sumie Sakai at Supercard of Honor in April 2018. Sakai was in the corner of Iwatani during Sunday’s match and celebrated with her after the match. The 25-year old also holds the Artist of Stardom championship with Saki Kashima and Tam Nakano and is a former two-time Goddess of Stardom and Wonder of Stardom champion for her home promotion.